A wide range of sporting goods to meet your needs, rom pool table to billiard accessories. All our pool tables (7ft, 8ft, 9ft, 10ft & 12ft) are the best quality at an affordable price. Prices from AUD 419.99. We also offer Australia-wide shipping. 7' X 3'9" 17' X 13'9" 15' X 11'9"
9' X 4'6" 19' X 14'6" 17' X 12'6"
If you are looking for a game table that is enjoyable for everyone, as well as adding a level of class to your home, then you cannot go past a pool or billiards table. 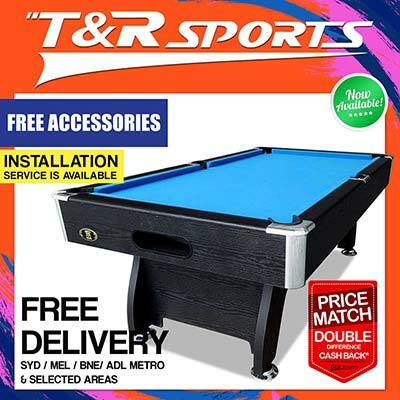 TR Sports has the billiard and pool tables for you. We are committed to making sure you get the best game table for your home or office. Expect quality from us. Collection Of Quality Pool & Snooker Tables. In our collection, we have some of the finest pool tables, created with the strongest materials available on the Australian market. With a variety of sizes and designs available, and available for affordable prices, you can be guaranteed that you will be enjoying our pool tables before you know it. With delivery available Australia wide, you can embrace this popular and class game with your friends and family. We ship Australia wide including Melbourne, Sydney & Brisbane. Plus, if you want to buy Buy Pool Table Accessories, please check our Pool Table Accessories. We ship Australia wide including Melbourne, Sydney & Brisbane.